Sister Bridget Mary Connor was raised in the suburbs of Philadelphia and met the Grey Nuns of the Sacred Heart at Bishop McDevitt High School in Wyncote, Pennsylvania. Following profession, Sister Bridget spent several years at St. Mary’s School in Kodiak, Alaska, as an elementary school teacher. She loved the great beauty of Kodiak and the children and families that she served. Following studies in Elementary/Special Education and Geo-science, she earned a degree in Administration/ Educational Leadership at the University of San Francisco. She is presently a Professor at Notre Dame of Maryland University where she teaches courses in Learning and the Brain, and Space and Earth Science for Elementary Teachers. She has publications in such journals as The International Journal of Learning and the International Journal of Pedagogy and Curriculum. She resides in the Baltimore area with another Grey Nun of the Sacred Heart, a friend of many years. As a Grey Nun of the Sacred Heart, I have been blessed! During my fifty years as a Grey Nun, I have had the opportunity to spend 18 years in Kodiak, Alaska. Here the people I encountered are as lovely as Kodiak’s sunrise and sunset with purple mountain majesty. Presently, I am serving as a professor at Notre Dame of Maryland University. This year completes my 18th year there. This, too, has offered marvelous experiences for me, challenging me in many ways that I could not dream. My novitiate, so carefully crafted, introduced me to the excitement of prayer and intellectual growth. Spiritual mentors began my early journey and they continue to inform me today. In my first year of teaching, it was Mrs. Teague who introduced me to what fine teaching was. A seasoned teacher, rarely upset, viewed every child as sacred. When I have been faithful to this, it has been my secret to success as a teacher. Fifty years later, it is my jubilee. The Hebrew scriptures hold the jubilee year as sacred. It is a time of restoration and freedom from slavery. I hope that this celebration is a time to be open to God’s graciousness. Gracious to forgive ourselves and not hold ourselves prisoner. Gracious to others in creating a home of comfort, particularly for the stranger. I am certainly grateful to my family and Grey Nun sisters who have accepted me and cared for me. I thank the many people in my life who have trusted me by sharing who they are with me. Blessings on us as we continue our journey together. An amazing individual with a soft heart and an awe inspiring way which makes you remember her forever. As a former student, she positively impacted my life. Thank you Sister Bridget!! Congratulations Sister Bridget!!! I, too, was one of her students at St Mary’s school in Kodiak, Alaska. Her enthusiasm and positivity made such a lasting impact on my childhood education and helped me build the confidence and courage to overcome any obstacles. I was so blessed to have her as a teacher! One of the most amazing people to touch my life. Blessed to have had her as a teacher, mentor, and friend. Congratulations to Sister Bridget! I was one of her students at St. Marys School in Kodiak, Alaska. 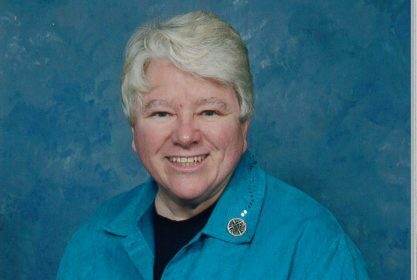 She was an inspired teacher who worked to broaden our understanding of social studies, science, and religion through quite challenging, hands-on activities. I’m a classic academic, so all of the simple machines that we would build really challenged me, while other students were able to shine. My first introduction to yoga was with Sister Bridget, as she had us doing cat and cow on the classroom floor! What a wonderful woman and teacher.